One of the easiest ways to incorporate protein to your diet is by adding it to smoothies. They can be a quick fix after your daily work, a nutritious breakfast to go, or even replace a whole meal, depending on the ingredients you combine. A recommended daily allowance (RDA) of 50 grams of protein is crucial for your body in order to repair cells and produce new ones. Protein is also important for growth and development in children, teens, and pregnant women. The best vegetable sources of protein are nuts, seeds, and grains. 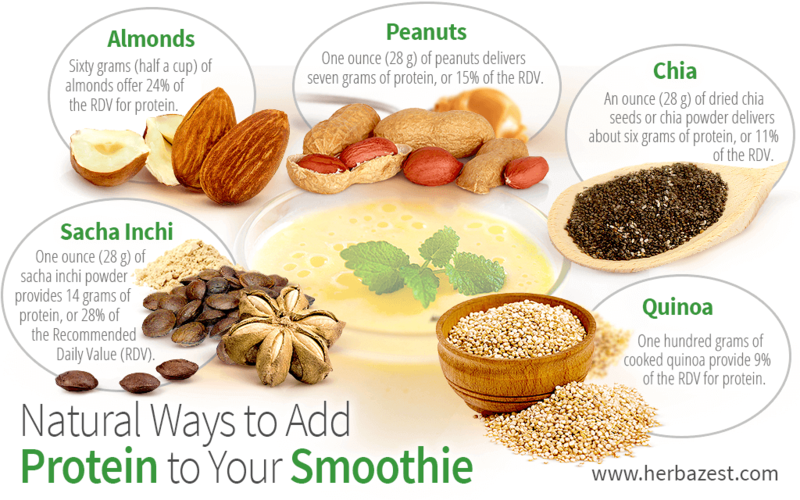 Here are some recommendations of protein-rich plants that can easily be incorporated to smoothies. Little known until recently, this Amazonian seed has shown to be the best known vegetable source of protein. One ounce (28 g) of sacha inchi powder provides 14 grams of protein, which means a whopping 28% of the recommended daily value (RDV), easy to digest and essential for maintaining and building muscle mass. Moreover, sacha inchi is also rich in omega-3, which helps regulate cholesterol levels and lowers blood pressure. Sacha inchi powder has a tasty, mildly nutty flavor that blends perfectly with all kind of fruits in smoothies. Almonds are one of the best sources of plant-based protein. Only 60 grams (half a cup) of almonds offer 24% RDV for protein. Almonds also are among the less caloric nuts and have high levels of antioxidants, especially vitamin E. Almonds can be added to smoothies whole, raw, roasted, or as vegetable milk, although the last form won't provide as much fiber. Peanuts are really legumes, like beans, but for nutritional purposes are considered as nuts. They were first acknowledged as a protein source during World War II, when peanut butter emerged as a nutrient-rich supplement. One ounce (28 g) of peanuts delivers 7 grams of protein, or 15% RDV. Peanuts have got a bad rap as a fatty food, but the truth is that at least 50% of their content is monounsaturated fat, the healthy kind also found in olive oil and avocados. Peanuts can be added to smoothies raw and unsalted, or in their creamy butter form. Chia seeds have great nutritional value. An ounce (28 g) of dried chia seeds or chia powder delivers about 6 grams of protein, or 11% RDV. In addition, they have the highest concentration of omega 3 and omega 6 among seeds and nuts, providing 82% and 50% RDV, respectively. Chia seeds are also rich in magnesium (27% RDV) phosphorus (24% RDV), and calcium (22% RDV). It is recommendable to soak chia seeds for at least half an hour before adding the, to a smoothie, but it is recommendable to soak the seeds for at least half an hour before so that they can double in volume and have a more satiating effect. The increasing popularity of this Andean grain is based in its many health benefits. Quinoa contains the highest levels of essential amino acids of any other grain. 100 grams of cooked quinoa provide 9% RDV for protein. Quinoa also offers high amounts of manganese (32% RDV), as well as magnesium (16% RDV) and phosphorus (15% RDV). All these minerals play a key role in calcium absorption, protein synthesis, and the formation of bones and teeth. Quinoa can be added to smoothies as a powder or previously cooked. These healthy options of plant-based protein will naturally enrich your smoothies, provide you with lots of energy, and improve your overall health. Genetics Home Reference, What are proteins and what do they do?